LONDON, United Kingdom — Holidays sales are critical to retailers. For retailers in the US, the world’s largest consumer market, 25 percent of annual sales happen during the holiday season, according to market research firm NPD Group. And since the 1870s, when Macy’s created one of New York’s first holiday window displays, these festive feats of visual merchandising have become not only a seasonal tradition, but powerful marketing devices. 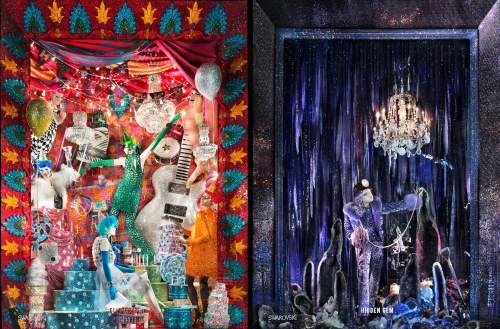 “It’s a lengthy process filled with perfection and precision,” says Alex Wells Greco, who leads visual merchandising at Harrods, on the process of creating the London store’s holiday windows, which often feature elaborate sets and fanciful themes. Indeed, fashioning holiday window displays can be a year-long endeavour, costing hundreds of thousands of dollars and upwards, and often beginning before last year’s windows are taken down. But with the rise of the Internet — digital touchpoints now influence three out of every four luxury purchases, according a recent study by McKinsey — why do brands and retailers still invest so much time and money in window displays? Indeed, the impact of holiday windows is often amplified online, when consumers take and share images of the displays on social platforms like Instagram or Facebook. “Windows may not seem to be a part of this digital age as it goes back to the earliest times of retailing in stores, but it actually does utilise digital in a strong way. Selfies and social sharing of the window visit are a big part of the communication of the brand at holiday. ‘Here we are at Macy’s’ or ‘Saks’ shots fill the pages on social media. [It’s] a great way to get in the brand on top of the mind game,” says Marshall Cohen, NPD’s chief industry analyst. 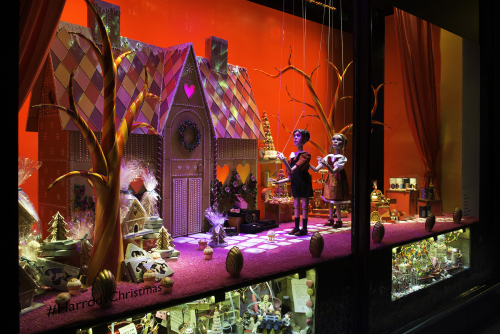 Here are some of this year’s best festive window displays. Which windows do you like most this season? Let us know in the comments below. In honour of Swarovski’s 120th anniversary, the New York department store teamed up with the fine jeweller to create five holiday windows crafted around the theme “Brilliant Holiday.” Featuring over 7 million Swarovski crystals, the displays include ‘The Crown Jewels,’ featuring crystallised suits of armour and ‘The Crystal Cavern,’ depicting a prismatic amethyst cave — all of which showcase custom clothing created by three of the store’s designers: Johnson Hartig of Libertine, Naeem Khan and CD Greene. This year Barney’s theme — ‘Chillin’ Out’ — included a group of Okamoto Studio’s artists sculpting winter animals from inside the Madison Avenue flagship’s windows, which passers-by can watch. 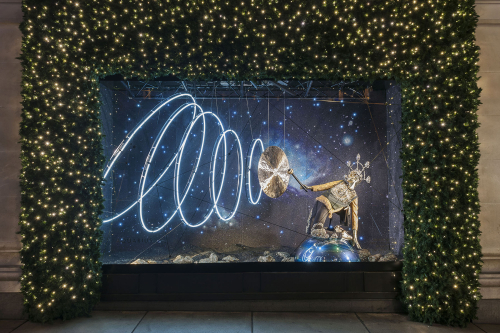 “We really wanted to keep our tradition of integrating a performance element into the windows; we felt like it elevates the entire experience,” says Dennis Freedman, creative director of Barneys. There are two key displays: ‘Arctic Chase,’ which features a group of crystal penguins traversing an icy race track in miniature 3D printed Lexus cars, and ‘Winter Brilliance,’ made up of 700 pieces of hand-blown glass, by sculptor Dale Chihuly. Selfridges’ astrological theme — ‘Journey to the Stars’ — sees the 12 windows of its London’s Oxford Street store depicting the different star signs and illuminated by over 400 metres of neo lights. Two scarlet red mannequin dressed in Alaia andDries Van Noten represent Scorpio, while the ‘Free as a Bird’ Sagittarius display features a set of iridescent, colour-changing feathers. This year, the windows at Harrods have been designed to replicate theatre sets, with red velvet curtains, spotlights and festive décor, while the London department store’s second set of smaller windows, installed two feet above the floor, feature Peter Pumpernickel, the toy mouse that was the star of last year’s campaign. One display also includes a gigantic gingerbread house that took 33 hours of baking, 20 hours of hand-piped sugar detailing and stands at over 4 feet tall. 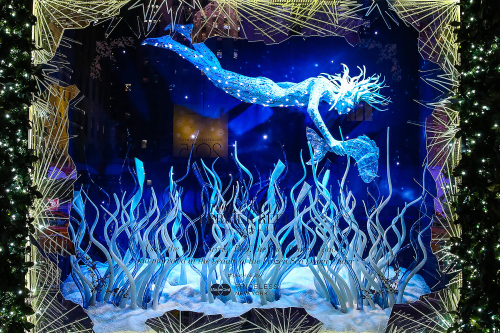 Bloomingdale’s has partnered with celebrity florist Jeff Leatham, who has worked with luxury brands like Tiffany and Alexander McQueen, to create a sensory holiday window experience. 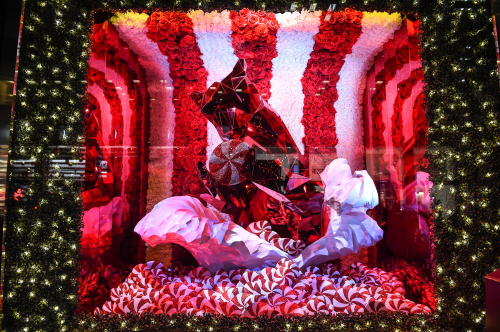 Instead of displaying merchandise, “our holiday windows take onlookers on an interactive journey to discover how sight, sound, touch, taste and smell shape the holiday experience,” explains Jack Hruska, Bloomingdale’s executive vice president of creative services. Displays include a pine-scented Christmas tree, and a collection of boiled red and white sweets, which are accompanied by a peppermint smell dispenser. 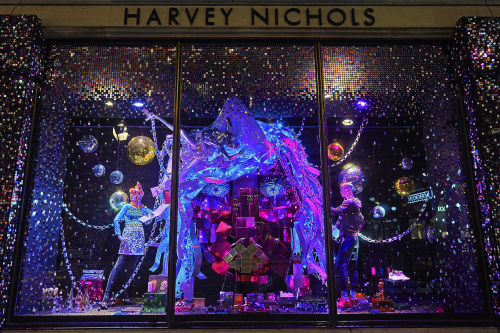 Harvey Nichols’ Studio 54-themed Christmas windows required one million glitter flakes, 300,000 sequins, 15,000 gift boxes, 620 mirror balls and 540 baubles to create. “We look to the catwalks for inspiration,” says Janet Wardley, Harvey Nichols’ head of visual display, of the decision to chose the iconic ‘70s nightclub as inspiration. “Following the shows, it was clear that the main trend for Autumn/Winter 2015 was Studio 54.” Alongside brands such as Christopher Kane, Lanvin, Alice & Olivia, Mary Katrantzou, Charlotte Olympia and Paul Andrew, the windows feature giant faces constructed from gift boxes with strings of fairy lights for hair. This year, Galeries Lafayette’s holiday windows tie-in to the newest film in the Star Wars franchise (premiering in December) and feature a robot family from the imaginary planet Scopi, about 2,450 light years away from Earth. 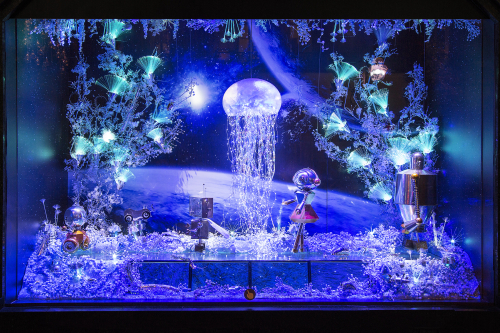 The windows depict the journey of a small robot, Leon, and his friend, Lumi, who spy the light of a Christmas ornament through a telescope and go in search of it: “Two of our windows are interactive while several others have digital screens that are part of the set,” said a spokesperson for the Paris department store. Titled ‘Let it shine, Let it shine, Let it shine. It’s Christmas again!’ La Rinascente follows its tradition of eschewing products for artistic projects. 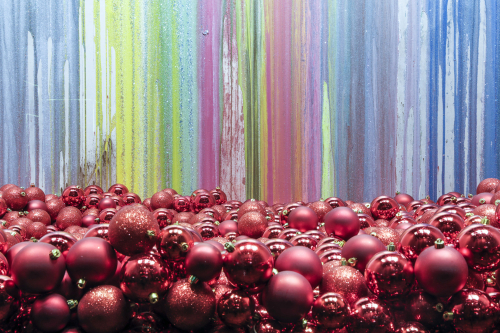 “We never display commercial items in our Christmas windows,” says Tiziana Cardini, fashion director of the Italian department store, which opted to display an artistic installation by Swiss artist John Armleder, featuring numerous metallic baubles placed in front of four large paintings, curated by Cloe Piccoli. 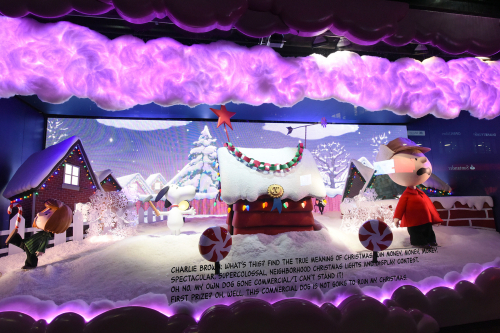 Ahead of the release of a new CGI Peanuts movie in 2016, Macy’s celebrates the 50th anniversary of iconic holiday special ‘A Charlie Brown Christmas’ with its windows. Designed by Macy’s national director of windows Roya Sullivan, the store’s six window displays feature key scenes from the 1965 classic, with large figures of the Charles Schulz gang, including Charlie, Lucy and pet beagle Snoopy. The New York department store’s ‘The Winter Palace’ spans the length of a block and features 225,000 crystal lights. 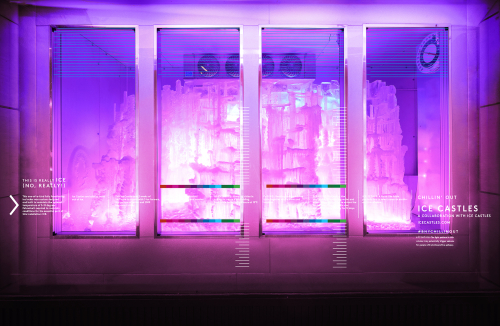 The display consists of towering light icicles, crystal palace spires and snowy magnolia arches that represent the “six wintry wonders of the word,” says Mark Briggs, executive vice president, creative of Hudson’s Bay Company. They include a frozen Eiffel Tower and ‘the Great Brrrrrier Reef’. Originally posted in The Business of Fashion, titled, Does Anyone Expect to Pay Full Price Anymore? Article written by Helena Pike. LONDON, United Kingdom — You’re in the middle of a Black Friday sale and you just snagged a bargain. Your heartbeat quickens; your awareness is heightened. Although you can’t see it, your brain has begun releasing neurotransmitters, such as serotonin and dopamine, which are triggering an adrenalin-like rush, resulting in an overwhelming buzz of euphoria. Fashion consumers are discount shopping more than ever — and while it was retailers that first encouraged them, with retail margins and full-price sales now suffering, those businesses may have shot themselves in the foot. In the US in particular, the run up to this year’s holiday season has not been happy. Many major department stores have seen their shares plummet, after announcing consistently disappointing sales. Since the beginning of 2015, Nordstrom’s shares have fallen 33 percent this year, while Macy’s shares crashed 14 percent in the third quarter alone, after it announced a 5.2 percent decline in sales. Shoppers, it would seem, are holding out for Black Friday, the day following Thanksgiving, when retailers traditionally offer large discounts. Last year, US sales on Black Friday topped $50 billion, a 9.5 percent increase in online sales compared to 2013. In the UK, where Black Friday has only recently begun to gain traction, online sales hit £810 million ($1.2 billion) last year, according to IMRG, the UK industry association for online retailers. “Does anyone really expect to pay full price for anything anymore?” asks Andy Mulcahy, editor of IMRG. Heavy discounting can be a downward spiral for retailers. By continually lowering prices, retailers risk falling down a rabbit hole, as consumers become conditioned to only shop during the sales. Before the recession, sales were generally biannual events, a way for retailers to clear stock before the new season arrived. Stores supplemented this strategy with additional promotions, but it was only after 2007 that Black Friday began in earnest. This change in consumer mind-set was further compounded by the emergence of online shopping, as e-retailers like Amazon not only gave customers access to discounts all year round, but also enabled them to shop around for better deals. “We started shopping online, driven by discounts,” says Martin Coedo Mestre, commerce strategy leader at IBM. As a result, the balance of power between company and consumer began to shift. Now, “people are in command,” Mulcahy says. It’s the most wonderful time of the year. Oh yes, the holidays are here. For many of you, the jingle bells may be less jolly and more maddening, but for me the holidays are a time for joy; the warm fuzzies, gathering with family, reuniting, being thankful, reflective, and enjoyably, generous…which, generally, turns into me getting a little crazy with the credit card on Christmas gift purchases (and perhaps a little indulgence for myself). And I’m just speculating, but I bet some of you are wondering why I’m talking about the holidays already, when Thanksgiving hasn’t even occurred. Well to all the Grinch’s and all the Scrouge’s, Thanksgiving is all but two days away, and the day after marks open season for madness of holiday shopping. I’ve been reading a book that has given me a lot of perspective on the clothes I wear, the places I shop, and my purchase behavior. This has also given me much thought into the carnivorous culture that is Black Friday; thrashing for the best deals, with little question of how great of a deal we’re actually getting (or lack thereof). Big-box retailers draw you in with their alluring, sometimes ambiguous, deep promotions. As a pursuer of entrepreneurship, I’m obviously a proponent of supporting small business, but as a consumer, learning what I have, my support has only become greater. I’m not trying to damn Black Friday or consumerism, instead I’m trying to shift the focus from the fast fashion frenzy and big box retailer’s outrageous super sales*, back to our own communities, neighbors, and friends. *Sale on limited product, while supplies last, for the first 2000 customers only, read terms of agreement, only available in Canada, may be life-threatening. All things accessories, clothing, and gifts! Located in Ladue. This Black Friday, you can anticipate 20% off everything in store, I’ll say that one more time; 20% off EVERYTHING in the entire store! If you don’t believe me, see for yourself. Check out more stuff from Ivy Hill‘s insta! Fabulous, affordable, fashion! Located in Webster Groves (WG native, whoop!) and St. Charles. Leopard will open @8am Friday morning in both locations, with these awesome doorbuster specials! On Small Business Saturday, you can expect 10% off everything in store, PLUS, a free gift with purchase!! Both locations will open @10am Saturday morning. Check out more stuff from Leopard‘s insta! A women’s lifestyle shop of carefully curated clothing and accessories! Located in the Central West End. On Black Friday you can expect 15% of all orders (code word: PUMPKINPIE), PLUS free shipping on all orders Friday-Monday! Check out more stuff from Living Collective‘s insta! I’m not going to tell you to stop shopping at the big box stores, but I will leave you with this; you cannot deny these delicious deals, nor the self-reward for your support. This year, give the gift of supporting small business!